Welcome to the second edition of The Write Spot, a bi-weekly author series spotlighting the many and varied places where writers write. 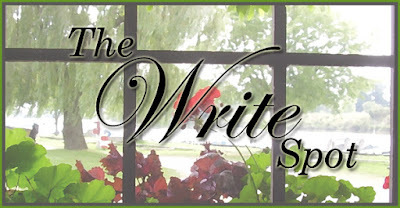 Today, I'm pleased to welcome romance author Fran McNabb to The Write Spot. As a retired English and journalism teacher, writing has always played a big part in Fran's life. Her novels have been published by Avalon Books, Montlake Romance, and The Wild Rose Press. Her historical romance, ON THE CREST OF A WAVE, was a finalist in the 2010 National Readers' Choice Awards. Fran grew up along the beaches and islands of the Mississippi Gulf Coast. After spending the first years of her marriage in Germany, she and her husband returned to the coast to raise their two sons. Whether it's sparkling waters or snowy mountains, setting plays an important role in her books. What a beautiful spot, Fran - so peaceful and comfy! 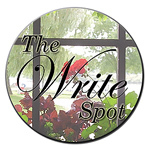 Now that you've shared your photo, tell us what makes it the "Write Spot" for you. I think my writing space says a lot about me. 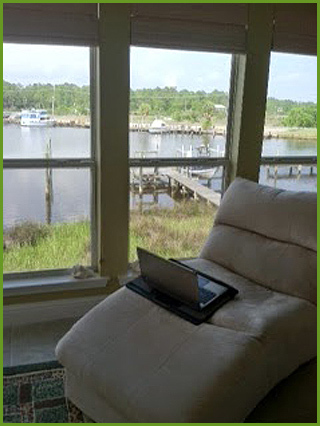 I live on a quiet bayou harbor on the Gulf Coast, and I do most of my writing from a chaise lounge in a sunroom that overlooks the harbor. From there I can watch the activity on the water as I find inspiration for my writing. We all have our favorite spots where we put our thoughts onto paper (or should I say the computer screen). I do have a really nice office, but from those windows I can’t see the water. I prefer to sit on my chaise where the calm harbor waters take away my life's worries, and I can lose myself in my stories. I wouldn't want to be without the view, but other than that, I "need" the candy dish filled with fun-sized chocolates! I'm starting a new book set in St. Augustine during the 1800's. It's an entirely new project so I'm not even sure it will come to fruition, but it's exciting to start something new. I'm also waiting on edits from The Wild Rose Press for a book that picks up where SAVING THE CHILDREN ended and follows the life of Max, one of the characters who helped rescue the children. I think it will be named KEEPING HOPE ALIVE. 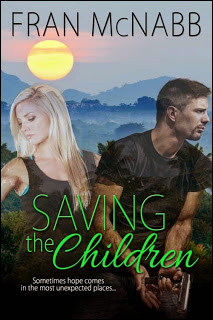 Fran's latest book, SAVING THE CHILDREN, is a romantic suspense set in the jungles of South America and published by The Wild Rose Press. Get it now. After losing her husband and unborn baby in a car accident for which she blames herself, Victoria Lafferty had devoted her life to helping South American children find homes in the United States, but her plans are thrown into chaos by a rebellion in the country. After his mission is compromised and he is shot and captured, Major John Dawson is kept alive so the rebel leader can "take care" of John himself for killing his brother. Together Victoria and John face the hostile jungle and the rebel leader, but will deep-seated guilt and a desire for revenge stand in the way of their life together? Thanks for sharing your Write Spot with us, Fran! Cheryl, thank you for having me on your lovely blog. I do love my writing spot and am glad to share a view of it! My pleasure, Fran. I might be just a wee bit jealous of your glorious view! Thanks for sharing with us. Cheryl, thank you for featuring Fran on your blog. Fran is a kind beautiful person who shares wonderful stories and art with us. 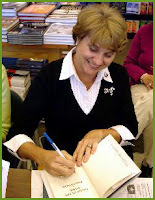 She is an inspiration for me and is always willing to help other authors on their journey. Fran, I can see why you love your "write spot". It's beautiful and serene, a great place to get away from the real world and enter your fictional universe. I haven't read Saving the Children yet, but having read other books by you, I know you tell a good story and am looking forward to it. Thanks for bringing this to us, Cheryl. I enjoyed reading this so much. I love Fran's writing and am now looking forward to my next one. Thank you for featuring her on your blog. Beautiful write spot, Fran. Your writing never disappoints. What an inspirational spot Fran. I think I might get lost in the view and forget to write. Good luck with your writing moving forward. You too Cheryl. Now you are retired maybe an update on your own Write Spot. So many visitors and lovely comments today ... Sheila, Susan, Adrianne, Joanne, Nanny, Sandy, and Trina - thank you all so much! I'm impressed that so many of you dropped by to say hello, and left such sweet comments. Again, I thank Cheryl for having me, and thanks to all of you who came by. I *loved* Saving the Children. And what a gorgeous spot you have for writing. I'm jealous since my writing spot has a view of the wall. :-) Best of luck with the new story! Can't wait to read it. What a serene, lovely "write spot," Fran. I can see why you'd choose the chaise lounger over your office. Like someone else said, I'm afraid I'd get lost in the view and forget to write.